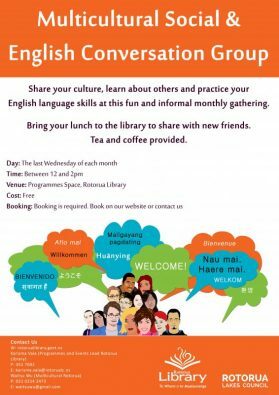 On the last Wednesday of every month there is a chance to practice your English at the Rotorua Library by sharing your lunchtime with many different cultures that exist in Rotorua. This is a Multicultural Association event. At the start one person shares his or her experience of migrating to New Zealand. Last month was the launch and a Chinese person shared her experiences and some traditional Chinese food. This month it will be someone from the Philippines. You can bring your own lunch or bring something to share with everyone. Tea and Coffee is provided. Everyone is welcome to attend and meet the many cultures that make up the Rotorua community. Starts at 12 noon on the last Wed. of every month (Wed. 26 April) It was a great experience for the many who attended in March, the first of many to come of such an event at the Library. A good chance to look around the library and maybe find something more about the featured culture of the day.